An ordinary mom, like all moms Simrun Chopra struggled with excessive weight gain, PCOS and back issues post pregnancy. Battling the weight and low self esteem she started on a fitness journey. With consistency and hardwork she dropped 4 sizes and 23 kgs in less than 5 months. This journey changed her outlook to the way we live and think of ourselves. Dropped 23 kgs in less than 5 months. I am an ordinary mom, like all moms I struggled with excessive weight gain, PCOS and back issues post pregnancy. Battling the weight and low self esteem I started on a fitness journey. With consistency and hardwork I dropped 4 sizes and 23 kgs in less than 5 months. This journey changed my outlook to the way we live and think of ourselves. Now a healthy lifestyle influencer, I focus on how to make sustainable lifestyle changes for a healthier mind and body. I don’t believe in quick fixes or fancy diets. I’m a mom, I understand the daily hurdles and this makes me realistic in my outlook to weightloss and healthy living. I had a tough pregnancy and dealt with a number of issues including gestational diabetes. Due to this I was on a strict diet plan. Post my delivery, I went a bit crazy eating, anything and everything without considering the consequences or even caring for the portions. I piled on the weight pretty quickly. Pregnancy and taking care of an infant takes a toll on the body. While it seems logical that we look at recovery and work towards restoring our bodies and making it stronger, nobody does. Before I knew it I had piled on the weight and had done nothing about my health. The weight, body changes from delivery, continuously bending and lifting a child ruined my lower back. I had muscle spasms after spasms, One day collapsing and unable to walk. I had a degenerated disc and budged discs. Because I was breast feeding I was unable to take muscle relaxants so I spent the next week crawling around the house.This happened nearly 3 times and the doctor said the only way to deal with it was to strengthen my body and lose weight. Looking back I’m appalled at myself, to have let it come to a do or die stage to decide to be healthy. How were you able to accomplish your Goals? I used to workout out 6 Days a week which was a combination of strength and cardio. Even after I lost the weight I have continued to work out as now I understand the importance and relevance of physical activity and its effects on our health and well being. Before I was eating just about anything. Unhealthy, processed, fried and oily food. Even though I was aware of their effects somehow I didn’t think eating one less biscuit or slice of cake would help me. Once I started my weight loss program I actively moved to a healthy lifestyle. I worked with every day home food but started eating in the right quantity and ensured each meal was a balanced meal. How did you include Fitness & Exercise in your lifestyle? Initially taking the time out seems daunting. It also seems like too much work. But just like anything in life, if we have to do it we have to do it. I took that outlook towards my health. I made sure there wasn’t really an option for me to flak off. Its hard work, getting up everyday. Working out really hard, watching what you eat the whole day, fighting your cravings. You feel like giving up every day. But you need to keep going. Success comes from continuously pursuing something. It comes from consistency. To make it easier and a part of my life I created goals. Small and larger goals to motivate myself. More importantly I factored in a time for my workouts every day. There was a time slot allocated that I and everyone else knew I would be unavailable. This made the biggest difference. By putting it in my routine I made sure it wasn’t something I did when I had time. I was something I just had to do. What would be your post-partum weight loss tips for the new moms out there? I think it starts during pregnancy itself. They need to be aware that being pregnant means you need to eat right and nourish your body to create a healthy child. Pregnancy is not a free ticket to binge. Follow the same parameters while pregnant and post partum. Factor in time for yourself. Usually a baby overshadows our need to look out for ourselves. But a happy mom means a happy baby, a healthy mom means a healthy baby. 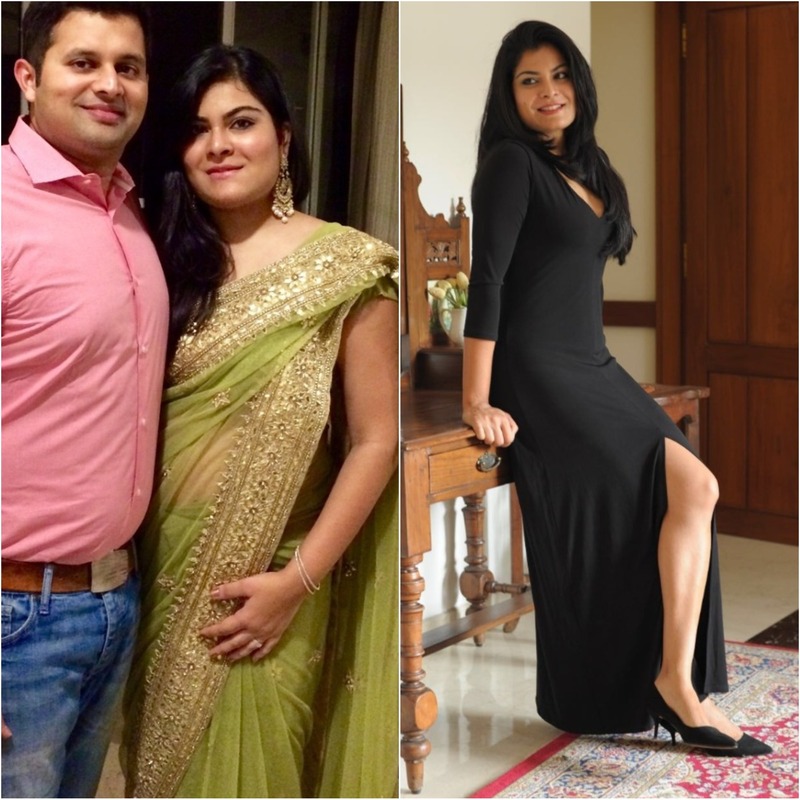 If Simrun’s story inspired you, click here to read more such spectacular weight loss stories!